Aerosmith guitarist Joe Perry can be seen rocking his “Sweetzerland Manifesto” lead single, “Aye, Aye, Aye”, with Cheap Trick vocalist Robin Zander and Stone Temple Pilots members Robert and Dean DeLeo during his album launch show at the Roxy Theatre in January in a newly-released live video for the track. 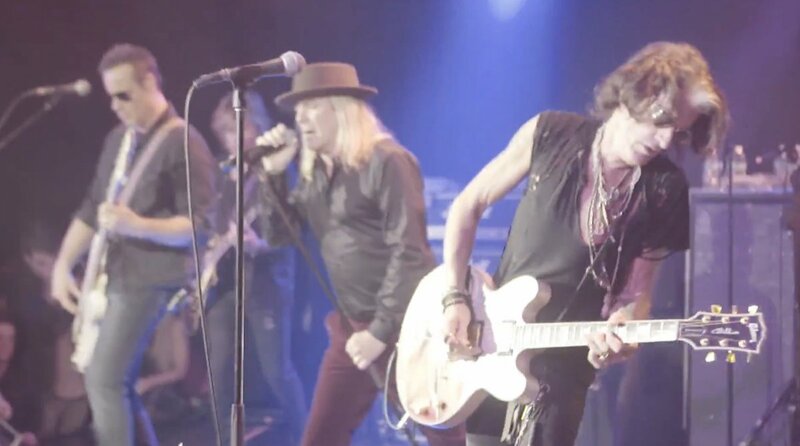 The January 16 Roxy event saw Perry joined by a lineup of guests that included album participants Terry Reid and David Johansen and executive producer Johnny Depp, as well as Slash, Extreme’s Gary Cherone and former Black Crowes frontman Chris Robinson. The Aerosmith guitarist’s first full studio record since 2009’s “Have Guitar, Will Travel” was recorded at Studio 1480 in Los Angeles and produced by the guitarist and Bruce Witkin, with additional help from longtime Aerosmith associate Jack Douglas, who co-wrote and co-produced a number of tracks.